Tag Archive | "Danios and Minnows"
Danios and Minnows are small, peaceful, active schooling fish that are well suited for housing in community aquariums. Most of the Danios and minnows kept in tropical fish aquariums are native to the fast moving fresh water rivers and streams of Southeast Asia, and many species are brightly colored. Danios and minnows are surface feeders and good jumpers. In an aquarium environment, a tight fitting lid is a must. Almost all Danios and minnows are hardy fish that are tolerant of a wide range of water conditions. 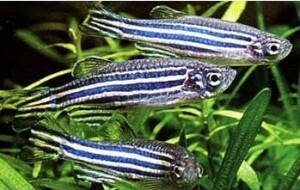 Because of this, they are often used to cycle newly set up freshwater aquariums. Because Danios and Minnows are so active, they are often used in aquariums to bring more reclusive species out into the open. 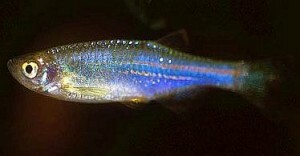 Danios and Minnows are readily available and relatively low cost. For this reason, they are often recommended as a starter fish for beginning tropical fish keeping enthusiasts. When keeping Danios and Minnows in a tropical fish aquarium, keep at least 6 to 8 individuals together in a small school. Most shoaling fish do not do well when kept individually in any size tank, but when housed in small schools, they seem to enjoy each others company and will thrive especially when housed in a well planted aquarium along with a piece of driftwood. These fish need plenty of room to swim so make sure the plants don’t crowd out their swimming area. Except for the South American Tetras, nothing presents a more aesthetic scene than a school of long fin Danios or white clouds milling about in a community tank. 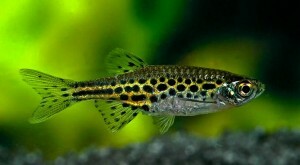 Almost all Danios and minnows are egg scatterers and easily bred. 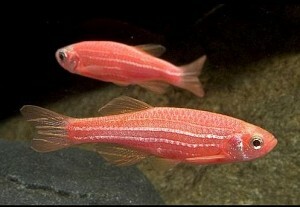 Danios in particular spawn with and remain loyal to one female. Breeding pairs should be placed in a breeding aquarium with fine leaved plants or a “spawning mop” for them to lay their eggs over. Most Danios will likely produce between 200 and 500 eggs that will hatch within a couple of days but the breeding pair should be removed from the tank as soon as eggs are scattered. They are voracious egg eaters. Fry should be fed finely crushed flake food, small pieces of brine shrimp or baby brine shrimp. Most Danios and minnows are omnivores and are easy to feed. They readily accept a varied diet of high quality flake foods, freeze dried bloodworms, small pieces of brine shrimp, etc. Danios and minnows are semi-tropical fish and prefer water with a pH between 6.0 and 8.0, hardness of no more than 19.0 dGH, a carbon hardness of 8 to 12 KH, and a temperature range of 68–80°F. They usually prefer the lower end of the temperature range. There are seven types of common Danios that are readily available to tropical fish keeping enthusiasts as well as a number of tropical minnows, some yet unidentified.